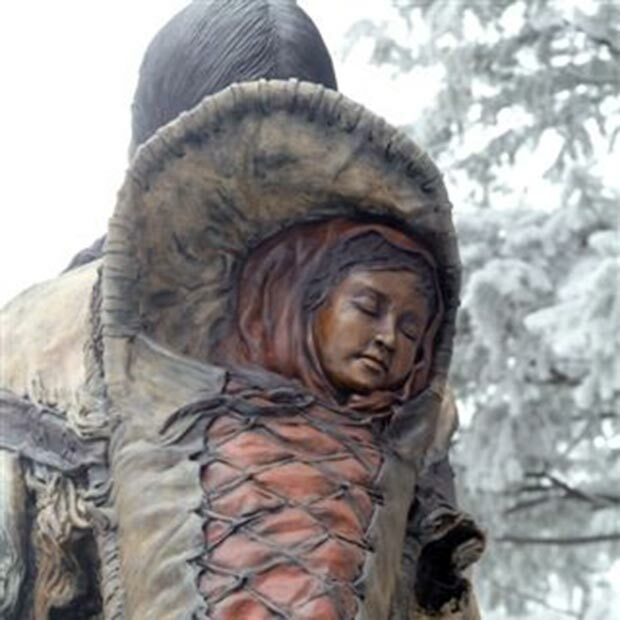 The Arduous Journey bronze sculpture of Sacajawea is situated facing east on Dayton’s Historic Pathway—just as she would have been as she traveled along the ancient Nez Perce Trail through the area on May 3,1806. 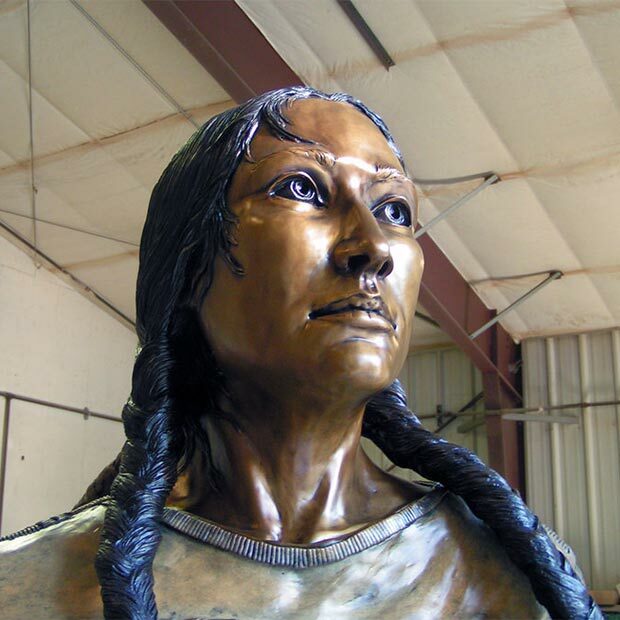 On October 10, 2009, these two landmarks were dedicated: the Historic Pathway, a sidewalk connecting the Dayton Historic Depot and the Smith Hollow Country Schoolhouse, and, located along the pathway, the Sacajawea sculpture by the late Carol Grende. Nearly three hundred people gathered to celebrate the completion of this project, which had been a joint effort involving community groups working with local and state government. Charlie Rising Sun, a Cheyenne Native American flute player performed his own creative compositions on large and small hand-made Native American flutes. His music beautifully conveyed a peaceful and loving spirit that deeply touched the crowd. Sadly, exactly one week later, Charlie passed away. Amy Mossett, a Mandan- Hidatsan Native American and a nationally recognized Sacajawea scholar, spoke of Sacajawea’s contributions to the Lewis and Clark Expedition. Mossett pointed out how Sacajawea’s knowledge of native plants allowed her to identify vegetation that was safe to eat. Because of her presence with her baby, hostile tribes greeted Lewis and Clark in a friendly manner. Sacajawea also assisted her husband, Charbonneau, in translating messages from Lewis and Clark to the natives they met along the way. With winter approaching, she secured needed supplies from her own people before crossing the Rocky Mountains. 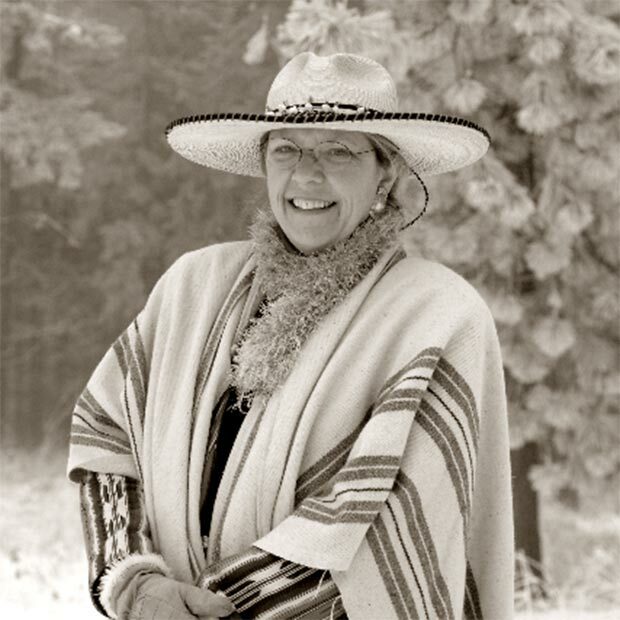 In closing, Mossett stated that some historians believe that without Sacajawea’s presence, the 1804-1806 Corps of Discovery Expedition would have failed. The dedication concluded with a closing prayer given by Chief William Burke of the Walla Walla Tribe. 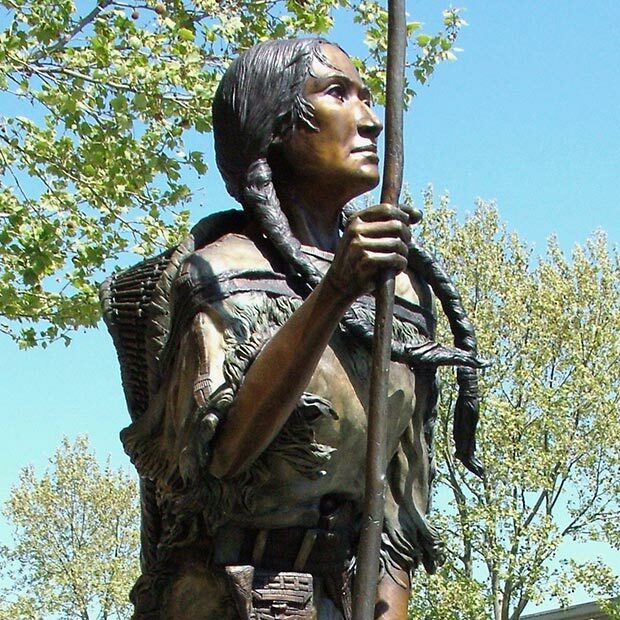 Dayton’s Sacajawea statue is a well-traveled piece. 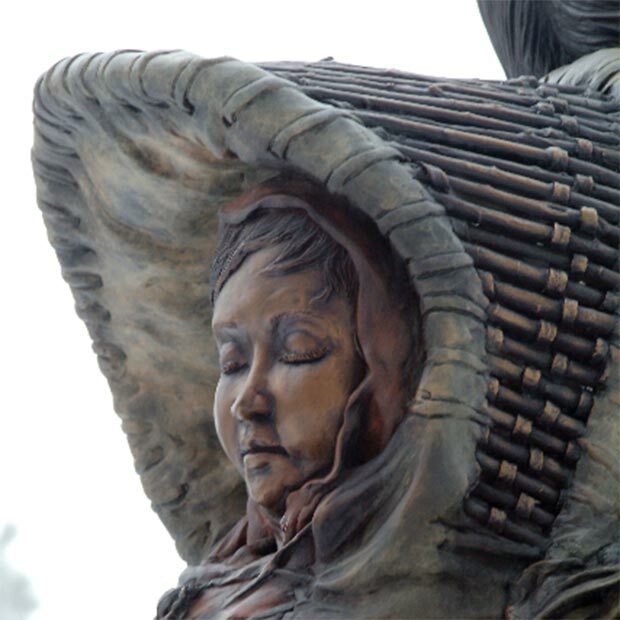 During the Bicentennial years (2004-2006) of the Lewis and Clark Expedition, sculptor Carol Grende traveled with this particular casting of her work in tow the full length of the trail—from Monticello to the Pacific Ocean and back to Dayton.